Power Station Valve is mainly used in pipeline, cutting off or connecting pipeline medium in various systems of thermal power station. Applicable medium: water, steam and other non-corrosive media. Compared with other valve products, the utility valve features high temperature and high pressure, unique self-sealing design. The higher the pressure, the more reliable the sealing. Due to the characteristics of performance technology and special working conditions, the product also has the characteristics that can not be replaced by other products. Main Parts Material and Application. 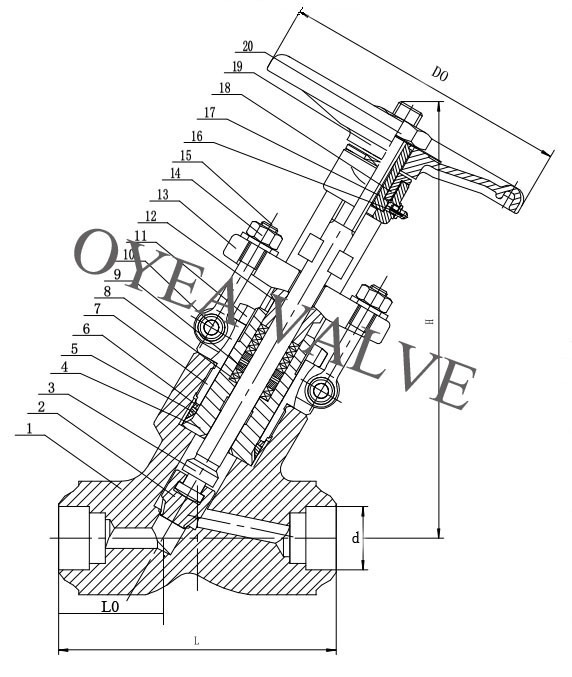 OYEA VALVE, a specialist manufacturer, established since 2018 and professional production of industrial valves over 10 years. We provide specialized sales service refers to different kind of region all over the world. Each sales team member is good at the local language and well experienced to the responsible market. For example: Malaysia, Indonesia, Southeast Asia, Vietnam, etc. Our factory owns the casting company by itself. We are always ready for providing the sample and producing some small orders, in order to meet the business well. OEM Service or Customized size is Available. 5. We can make the products with the client's demand standard or the custom requirement. We are always ready to hear from you, be responding to your enquiry immediately. Our trade manager is always online for you. We have strict quality control system and amounts of testing equipments for different kind of valve, such as size, pressure, working environment etc. We are winning the market reputation with the time goes by. We have the large stock for some hot products. 10. We are the manufacturing company which not only has our own manufacturing workshop, but the casting company as well. We provide the straight factory price and service to our customer. 14.Online Service: any inquiry, please contact me. We will reply you within 12 hours. Wenzhou Oyea Machinery Co.,Ltd. is a manufacturer;it was established in 2018,located in Heyi Industrial Zone,Yongjia County,Wenzhou City,Zhengjiang Provice,China.The company has successful foreign trading experience in South America,Africa and Southeast Asia/Mideast. API DIN GOST Standard Cast S..
Gate Valve that opens by lifting a round or rectangular gate/wedge out of the path of th.. Cast Steel Stainless Steel F.. Swing Check Valve is used to prevent back flow in the line. ANSI GB Cast Steel High inle..
Power Station Valve is mainly used in pipeline, cutting off or connecting pipeline mediu..
Power Station Pressure Seal ..
ANSI GB JIS DIN High Pressur..
ANSI API Cast Steel Forged S..
ANSI API DIN Cast Iron/Steel..
Globe Valves are used for throttling and frequent operation.